Instead, we created Cedar: a single, general-purpose stack with no native support for any language. Adding support for any language is a matter of layering on a build-time adapter that can compile an app written in a particular language or framework into an executable that can run on the universal runtime provided by Cedar. We call this adapter a buildpack. Writing objects: 100% (67/67), 26.33 KiB, done. and installing Heroku-specific plugins for logging and serving static assets. The slug that results from this Rails-specific build process can now be booted on our language-agnostic dyno manifold alongside Python, Java, and many other types of applications. In the example above, the appropriate buildpack was automatically detected from our list of Heroku-maintained defaults. See the full list of third party buildpacks in the Dev Center. In addition to enabling new language support, the ability to select a buildpack allows you to modify the previously closed Heroku build process for popular languages. For example, consider a Ruby app that needs to generate static files using Jekyll. Before buildpacks, the only solutions would have been to 1) generate the files before deployment and commit them to the repository or 2) generate the files on-the-fly at runtime. Neither of these solutions are ideal as they violate the strict separation that should be maintained between the codebase, the build stage, and the run stage. By forking the official Ruby buildpack, you could add a site generation step to your build process, putting file generation in the build stage where it belongs. All of the default buildpacks are open source, available for you to inspect, and fork to modify for your own purposes. And if you make a change that you think would be useful to others, please submit an upstream pull request! Your app might depend on binaries such as language VMs or extensions that are not present in the default runtime. If this is the case, these dependencies can be packaged into the buildpack. A good example is this fork of the default Ruby buildpack which adds library support for the couchbase gem. Vulcan is a tool to help you build binaries compatible with the 64-bit Linux architecture which dynos run on. Buildpacks are potentially useful in any environment, and we'd love to see their usage spread beyond the Heroku platform. Minimizing lock-in and maximizing transparency is an ongoing goal for Heroku. 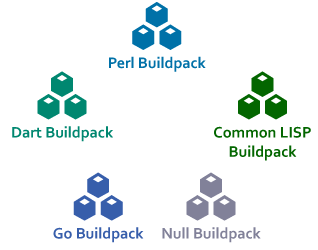 Using buildpacks can be a convenient way to leverage existing, open-source code to add new language and framework support to your own platform. Stackato, a platform-as-a-service by ActiveState, recently announced support for Heroku buildpacks. You can also run buildpacks on your local workstation or in a traditional server-based environment with Mason. Get started hacking buildpacks today by forking the Hello Buildpack! Read up on the implementation specifics laid out in the Buildpack API documentation, and join the public Buildpacks Google Group. If you make a buildpack you think would be useful and that you intend to maintain, send us an email at buildpacks@heroku.com and for potential inclusion on the third-party buildpacks page.